Peter was raised in the eastern suburbs of Melbourne, attending Box Hill Primary School and Koonung High School (in Box Hill North). The family home was a place of open welcome and warm hospitality to a broad cross section of visitors. This reflected the strong Christian faith environment in which Peter was nurtured. 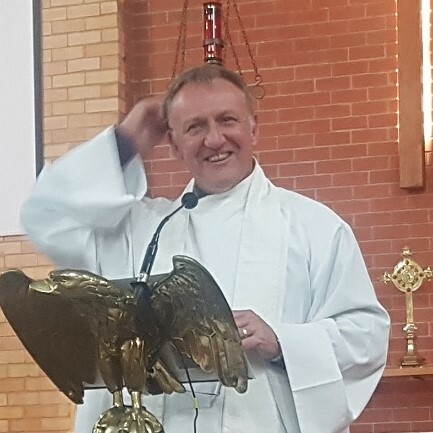 Peter’s spiritual home, up to the age of about nineteen, was St John’s Blackburn before being involved in youth ministry in Wattle Park (Melbourne) and Turvey Park (Wagga NSW). In the latter part of high school and for about four years after high school, Peter had various secular jobs including some holiday work on a friend’s farm near Donald and cleaning and handyman jobs in aged care facilities in Melbourne and Wagga. Having married Jeannette in 1985, the young couple moved to Ridley College in 1986 to start theological study. In 1988 Peter was accepted as a candidate for the Diocese of Melbourne but with a view to serve with Bush Church Aid (BCA) once he had completed his curacies. Peter has the rare distinction of serving three curacies all in the western region of Melbourne Diocese. Peter and Jeannette, and by then with two young children, moved to Blackwater (a mining town) in Central Queensland with BCA in 1992 and served there and in Winton (an outback pastoral town) until 1999. Their time with BCA was truly enriching and provided valuable experience for later ministry. After both their mothers were widowed, they moved south again to be nearer family. Since 1999, Peter and Jeannette have served in three parishes in the diocese of Canberra and Goulburn, most recently for nine years in Tumut. Tumut is primarily a timber town but with influences of the Snowy Hydro and serves as the northern gateway to the Kosciusko National Park. Peter’s ministry beyond the parish level has included some time on Bishop-in-Counsel for both Rockhampton and Canberra and Goulburn diocese as well as doing a term as Rural Dean while in Tumut. Also while in Tumut, Peter has served as Chaplain to NSW SES Murrumbidgee Region. This has developed his skills in Resilience training and critical incident stress management. In every parish in which Peter has been involved, he has found a way to engage with the wider community. Jeannette’s nursing work compliments this as well. He also enjoys football, cricket (actually, most sport), trains, gardening, and a nice drop of ‘red’. Peter and Jeannette have two married children. The oldest is James, who with his wife Chamaine, lives in the stunning countryside of Perthshire, Scotland, and their daughter Megan and husband Damien live in Warrnambool. They are busy raising three boys who are a delight to their grandparents.